Given the title of this blog, it is fitting that my first post deals with passionfruit. My generous neighbour, Renate, recently gave me a couple of bags of passionfruit from her prolific vine. She advises me that the secret to her success is the fact that the vine is growing at the end of her leach drain. As I am going through a home-made yoghurt phase (more on that later), I decided to make passionfruit syrup to drizzle on my yoghurt. Put the sugar and the water into a pot, stir over low heat until the sugar melts. Add the passionfruit pulp, bring the syrup back to just below the boil and very gently simmer it for 3-5 minutes. Cool slightly then put the syrup into a food processor and pulse a few times to release the pulp from the seeds. Pour the syrup back into the pot and bring back to the just below the boil. Pour the syrup into sterilised jars and seal. Store in the refrigerator. The syrup should last several months in the refrigerator. If you do not intend to consume the syrup within this time or prefer to store it in your pantry then I have read, if you add ½ a teaspoon of citric acid to the syrup, you can store it for up to one year in your pantry. Once open, store in the refrigerator. The boiling water method is not recommended for preserving passionfruit as passionfruit does not take well to extensive heat. The flavour is affected. Perfect on yoghurt or served with ice cream. I made this recipe the other day (Renate gave me another bag of passionfruit). I followed the recipe exactly. How good does it look? I have my own passionfruit vines now and have passionfruit galore. I have made 18 bottles this year. My passionfruit are a different variety so the syrup is a little darker but equally nice on my morning yoghurt. 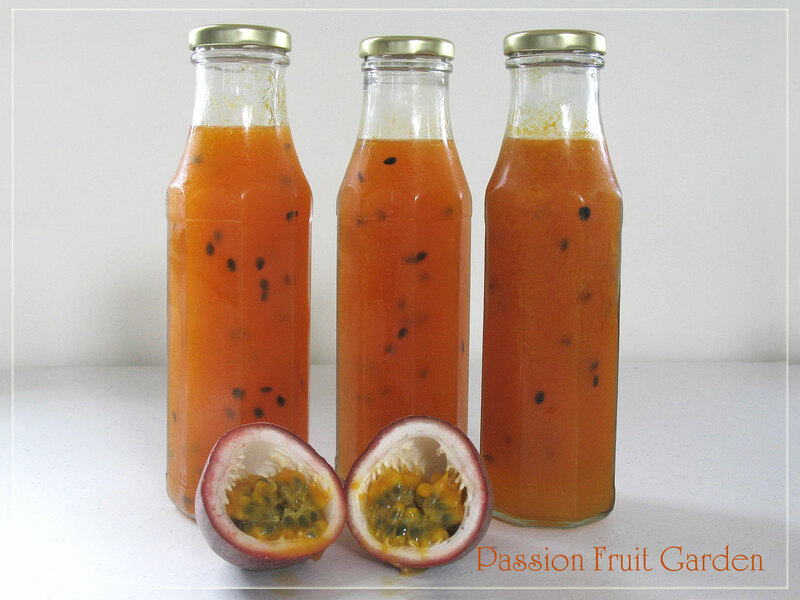 This entry was posted in Cordials, syrups etc, Homemade Produce, Passionfruit, Preserving the bounty and tagged Passionfruit, Preserve passionfruit pulp, Preserving, Syrup, What to do with excess passionfruit? by Glenda. Bookmark the permalink. Enjoyed reading your article .is there any way I can preserve passion fruit pulp without sugar. Hi Sara, the only way I know of is to freeze it. 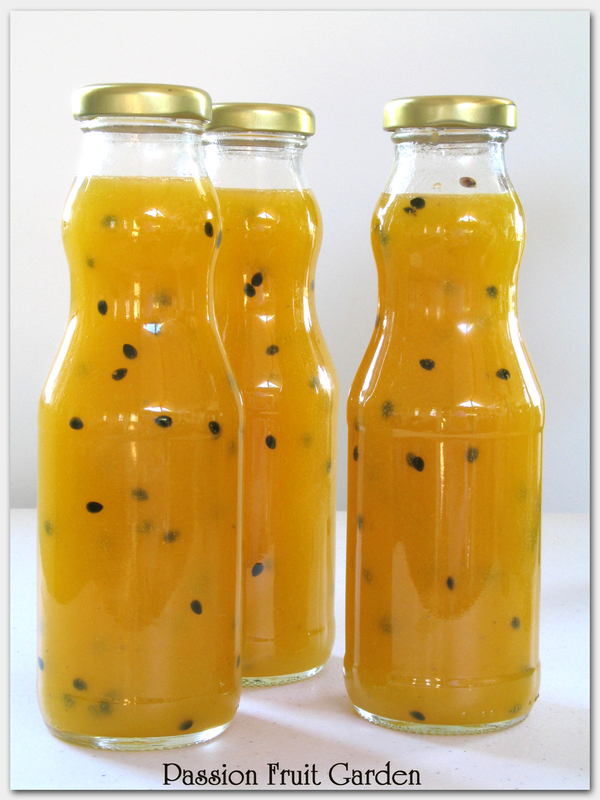 I have a lot of passion fruit pulp from last year in the freezer and I would love to make this syrup. My passion pulp has a lot more seeds in it. Can I just use the concentrate in place of the pulp? Hi Tiffany, I am not sure I know what you mean by “concentrate”. If you mean something commercial, I would not use it. This recipe uses passionfruit pulp. The seeds are sifted out and then a few are returned, primarily for cosmetic purposes. The pulp you have in the freezer will do just fine. I just made some syrup. I did it almost exactly. I just added the juice of one lemon. It turned out spectacularly but it didn’t make a lot. Just 3 little jars. I’ll have to make a lot of batches. I have soooooo many passionfruit! Hi Rita. Thanks for leaving a comment. I usually get about three cups. I wonder why you got so little. Maybe I get more of the pulp because I use an electric mouli. Btw I also make passionfruit jam. You might want to try that too. Hi Julie. It is perfect for yoghurt, ice cream and smoothies. All the best. Hi. I had been told that passion fruit would not thrive here in Missouri USA. I am pleased to say that mine are producing a huge amount this year. It is the first year they have as this it our 3rd year having them. I use the leaves for tea that is just as relaxing as chamomile, and now (thanks to your blog) I have syrup in the fridge and will soon have preserves to store up. I just wanted to say my wife and I use honey from our bees as sweetener. Try it, it’s very good. We try to be as self sufficient as possible on our 60 acre place. This adds to the whole very nicely. Thanks for the information. Hi Ken, Thanks for stopping by and commenting. The syrup lasts ages unopened, at least one year, so make lots. 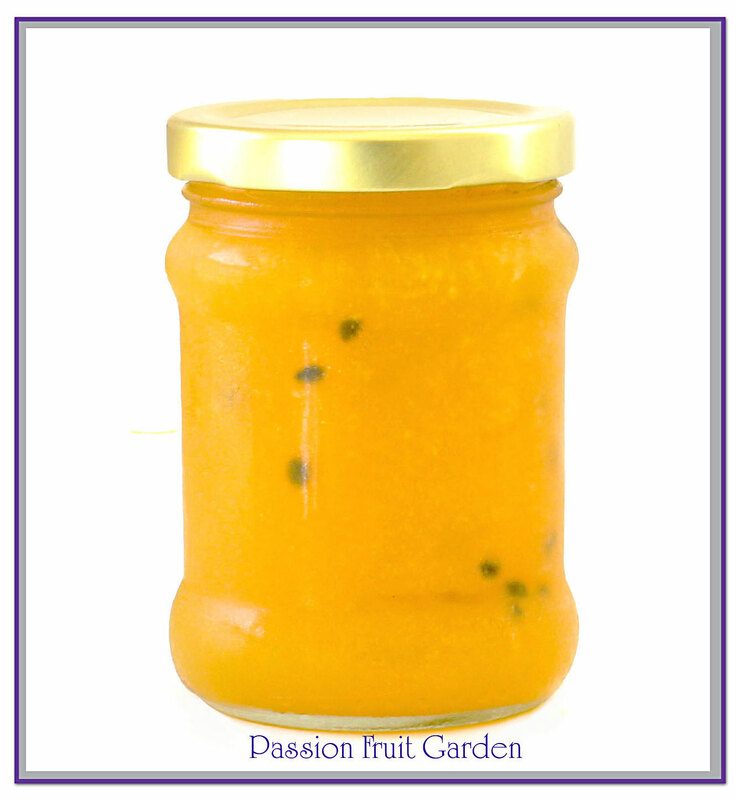 Have you tried the passionfruit jam I made? That is also very popular? And do try the passionfruit tart. Everyone loves it. Yes, We should have enough to make a batch of preserves in a couple of weeks. I was wondering how long our syrup would keep. Thank you for answering my question before I asked:-) I wonder if my using honey as sweetener will slightly extend that. Honey is a natural preservative as I’m sure you know. I do plan to try the tart as well. We have found that strawberry and banana smoothies are great with the addition of passion fruit. I’m having fun with them. Hi Ken, I have a cool room and I have unopened syrup that is 18 months old and it is perfect. Obviously, once open it must be kept in a fridge and used within a reasonable time. I am sorry I have no idea about the life of the syrup with honey rather than syrup. As you know, it is the sugar and acid that acts as the preservative so depending on how much you used it should be ok. I make banana and passionfruit syrup smoothies for breakfast. It is also very good with mangoes. Hi Jo, I do put the pulp into a food processor and pulse a couple of times to release the seeds. Is this what you mean? 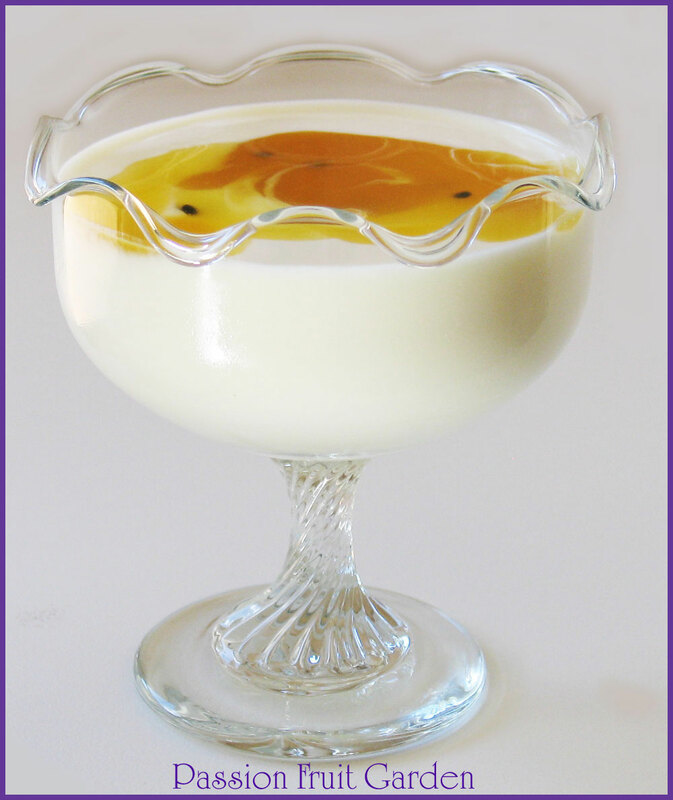 Thanks for sharing, I discovered your page when searching for ways to use my excess passionfruit. I will use the syrup recipe but was also looking for something with little added sugar.My vine is not at the end of a drain but rather over a beloved pet dog’s grave – and growing rampant. Dear old Mindy continues to give even from the grave! Coleta. Hi Coleta That is lovely that you have grown your passionfruit over Mindy. Every time you eat one, I bet you think of her. BTW My mum used to have a little silky terrier called Mindy. Hi there only just found your page. Just wondered if you keep this syrup in the fridge or is it sealed and in your pantry? Hi Kerry-Anne. I keep mine in the fridge and it lasts for months and months. I don’t bother adding the citric acid as I know I will use all I make within 6 months or so. If you want to keep it in the pantry, or keep it for more than one year, I would add a bit of citric acid. Carol, glad you are up and walking. Glad you like it. Mum asked me today for a recipe for passionfruit syrup. In the same conversation she mentioned you had set up this blog. Guess who will be cooking this for 40 people on Sunday and its not me… Love the website, its fantastic. The passionfruit syrup looks great, but I’m not too sure about those grundies!! I wonder who they belong too!!! The big ones are mine, of course! The little ones belong to Maus. Looks promising. Looking forward to following! Sounds lovely! When can I try some?